Exploring animals and nature is my passion. 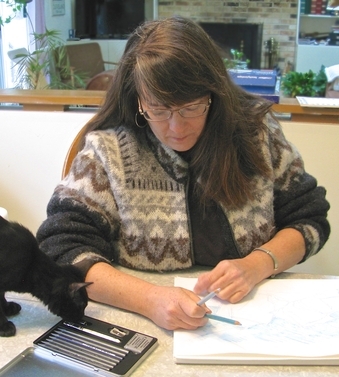 From an early age, I enjoyed drawing, painting, modeling and interpreting creatures of all kinds. I grew up in Western Pennsylvania within a family tradition of artistic pursuit. My twin sister Leslie and I were exposed to all sorts of art materials and techniques. Trips to the Carnegie Museum of Natural History in Pittsburgh provided endless fascination. Maybe I saw dinosaurs and the famous taxidermy work Camel Driver Attacked by Barbary Lions too many times, but these trips fostered an enduring animal obsession. I even pursued taxidermy correspondence courses! My professional experience has been in the museum field as a curator, writer, exhibit fabricator, educator and administrator. I've worked in museums and history centers in Pennsylvania, New York, and Delaware, and pursued projects ranging from the history of sound-on-film to working the waters of Delmarva. Throughout my career, I've continued to create images and objects expressing a life-long interest in animal life. I hold a BA in Art from Gettysburg College, and an MA in Art History from University of Delaware. I have extensive experience working with graphic designers and taking projects from the conceptual stage through execution and completion. I'm a published author with established writing and editing skills. I've worked with audiences and students of all ages. 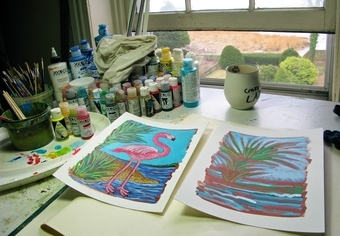 And here's what I believe: Regardless of past experience, you can also learn to explore your own creativity. Colored pencil, watercolor, gouache, acrylics, ink, mixed media on paper, board, wood; computer graphics with a Wacom Intuos 4; experience with Adobe Illustrator CS5, Adobe InDesign CS5, and Aperture 3.3. She even has experience with seashells, driftwood, Mardi Gras beads, beer caps, and other assorted and sundry found objects. Above, top: Young artists at work. 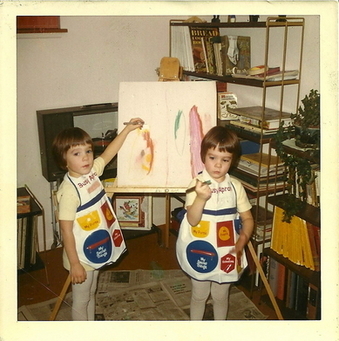 Even as kids, Leslie and Stephanie Przybylek knew their way around a paintbrush! Below: Creative Animal also enjoys fermenting a good brew now and then, and we are always game to produce a personalized label or two! 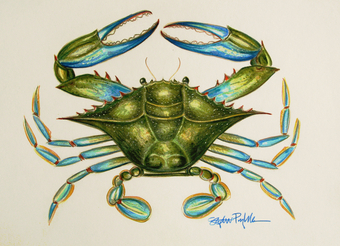 Blue Crab, colored pencil and watercolor on illustration boardl. Inspiration comes from the land and sea around us. Cats or dogs? I'm equal opportunity! 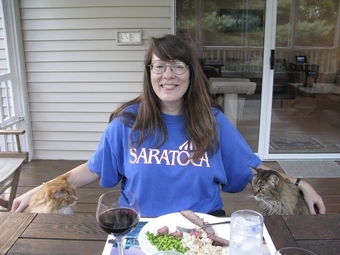 In this case, enjoying a meal with cherished feline friends.